Puppy Development I and II with Rick and Ronnie Smith DVDs . $79.90. "I have already started using them, and my pup is responding well." I really like the techniques that the Smith's use. I have already started using them, and my pup is responding well. Enjoyed this introductory video set -- reasonable cost for some priceless advice on how to introduce your pup to the basics prior to beginning more advance training. 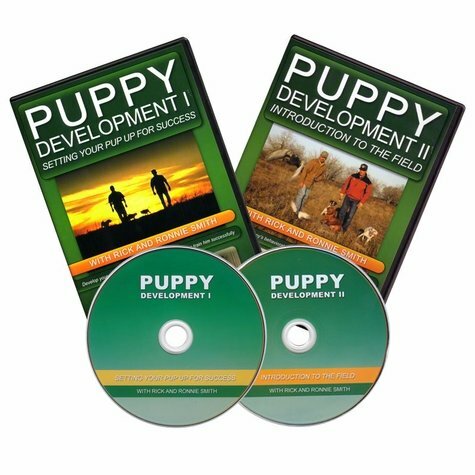 This DVD set will set up your puppy for success in the field. Puppy Development reviews six opportunities to gain your dog's willing acceptance of restrictions which is necessary for training. This willing acceptance behavior will be demonstrated in six sections. The Smith family has provided bird dog training for almost a century and training seminars since 1968. Rick and Ronnie Smith are products of this training tradition and bring to you a lifetime of knowledge and experience. Rick and Ronnie operate training kennels, guide quail hunts, have trained numerous National and International Champion Field Trial winners, produce training videos and teach seminars all over the world.